Quadrant is a protocol designed to organize disparate data sources and facilitate the creation of new data products from those sources. Central to Quadrant’s aims will be the ability to stamp the data when it joins the network using the SHA-256 hashing algorithm. This means each consumer of data on the Quadrant network can be assured about where the data came from and that it is genuine and has not been tampered with. Quadrant represents the first real attempt to democratize the data economy, while at the same time creating a powerful new method to completely ensure the integrity and provenance of data. The modern world is increasingly reliant on huge volumes of data, to advance scientific research, drive businesses and shape government policy. To date, the economy that has evolved around data has been inefficient, heavily biased towards a number of large players and virtually unprotected against a large amount of fraudulent data that is being sold. Data generators, or nurseries as they are known on Quadrant, upload their data to the network and it is stamped with its SHA-256 hash. This creates an immutable record on the blockchain that assures end users that the data is genuine and has not been compromised. By mapping a large amount of data sources in this manner, Quadrant then creates the ability for new data products, called constellations, to build from these sources. These constellations are built using smart contracts. The builders of constellations are called Pioneers and they can distribute constellations to end users called Elons on the network. Quadrant will utilize its own token with these smart contracts and this allows a much fairer distribution of the rewards between the various stakeholders. How did Quadrant begin and who Invented it? There is an inherent unfairness in the availability of data to different organizations today. Large companies like Google and Facebook can collect and retain vast amounts of data, giving them a considerable advantage over smaller companies that lack this kind of ready access to data. There are a huge number of data silos available across the world that are not mapped in any kind of meaningful way. 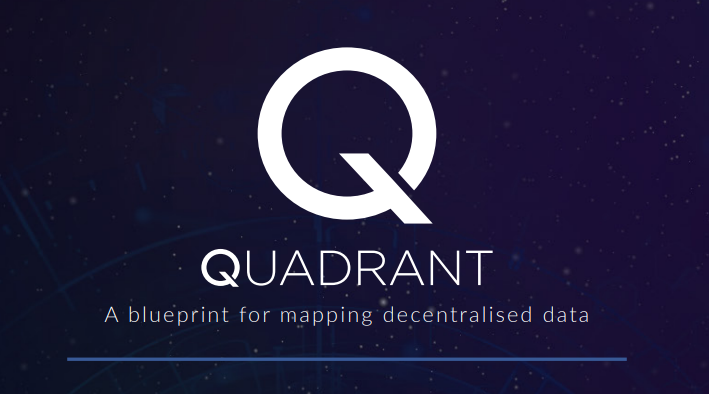 Quadrant aims to bring all those data sources together on one network, in a manner that guarantees the integrity of the data, make that data accessible to organizations of all sizes and facilitate innovation in the form of new data products, or constellations. The team behind Quadrant has an exceptionally strong technical background in Big Data and blockchain technology. Founder Mike Davies has dedicated a number of years to solving the issue of trust in the data economy that is key to revolutionizing the industry. Having worked with major IT firms across the world and developing a deep understanding of the power, and the limitations, of Big Data, Mike identified blockchain technology as the ideal way to not only distribute data fairly but also to verify its authenticity at all stages. Quadrant is providing the opportunity for crypto investors to get on board this revolutionary project at an early stage. In its Token Generation Event (TGE), it will crowdfund its token, EQUAD, that will drive its network. All fees and payments on the network will be done in EQUAD. The data space is going to become ever more important to business as well as academic research. The increased reliance on AI and machine learning for business applications alone will drive a very strong demand for an easily accessible and versatile data supply platform like Quadrant. Quadrant is in a particularly strong position with a first mover advantage. With no real competitors, it is poised to take a dominant position in the market when it goes live. While Quadrant does provide a lot of growth potential, investors will be buying into a platform that isn’t live yet. It has an excellent plan and a market does exist for this startup, but the project is still in the early stages of implementation. The network is not expected to be fully in place and functioning until January 2020. Find out more on the website: https://www.quadrantprotocol.com/.